Simple, colorful, easy-to-understand. All the formulas in one place where someone not strong in math (like me!) can make sense of them, and there are 'thought bubbles' with helpful hints in them too. I've always had trouble sorting out these formulas because they sometimes look different depending on the source, and I think I finally have what works! 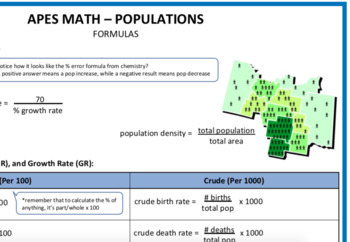 Includes formulas for percent change, doubling time, population density, birth/death/growth rates (both crude and %), and population change.